This memory foam gel infused mattress is a revolutionary support surface that provides unprecedented pressure redistribution, rapid heat dissipation, and vast increases in breathability compared to traditional "Temperpedic" foam. This pressure redistribution mattress uses the newest gel infused memory foam to offer superior protection and prevention of bed sores and pressure ulcers. This pressure relief mattress will reduce the reoccurrence of pressure sores by channeling heat away from the body significantly faster than traditional foam, virtually eliminating perspiration and heat build up. Superior pressure redistribution is delivered by providing more support and less cradling at higher levels of compression, redistributing pressure over a large surface area eliminating static fatigue. The heel section of the memory foam gel infused mattress is sloped 30 degrees to redistribute pressure throughout the entire leg. The top heel area is covered with a patented, highly resilient aerated foam, keeping skin cool and dry. Optional Raised side rails reduce risk of falls and increase patient safety by providing a firm perimeter for egress and ingress. Rails are 3 inches high with a 24 inch cutout. This memory gel infused pressure relief mattress can replace uncomfortable inner spring hospital mattresses. It is designed to go directly over a twin sized box spring or standard medical bed frame. This premium pressure relief mattress is far superior than any gel mattress on the market today. Heals and prevents bed sores. Free Shipping. This memory foam gel infused mattress is a revolutionary support surface that provides unprecedented pressure redistribution, rapid heat dissipation, and vast increases in breathability compared to traditional "Temperpedic" foam. This pressure redistribution mattress uses the newest gel infused memory foam to offer superior protection and prevention of bed sores and pressure ulcers. 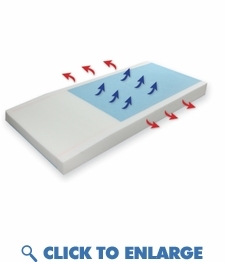 This pressure relief mattress will reduce the reoccurrence of pressure sores by channeling heat away from the body significantly faster than traditional foam, virtually eliminating perspiration and heat build up. Superior pressure redistribution is delivered by providing more support and less cradling at higher levels of compression, redistributing pressure over a large surface area eliminating static fatigue. The heel section of the memory foam gel infused mattress is sloped 30 degrees to redistribute pressure throughout the entire leg. The top heel area is covered with a patented, highly resilient aerated foam, keeping skin cool and dry. Optional Raised side rails reduce risk of falls and increase patient safety by providing a firm perimeter for egress and ingress. Rails are 3 inches high with a 24 inch cutout. This memory gel infused pressure relief mattress can replace uncomfortable inner spring hospital mattresses. It is designed to go directly over a twin sized box spring or standard medical bed frame. This premium pressure relief mattress is far superior than any gel mattress on the market today. Heals and prevents bed sores.